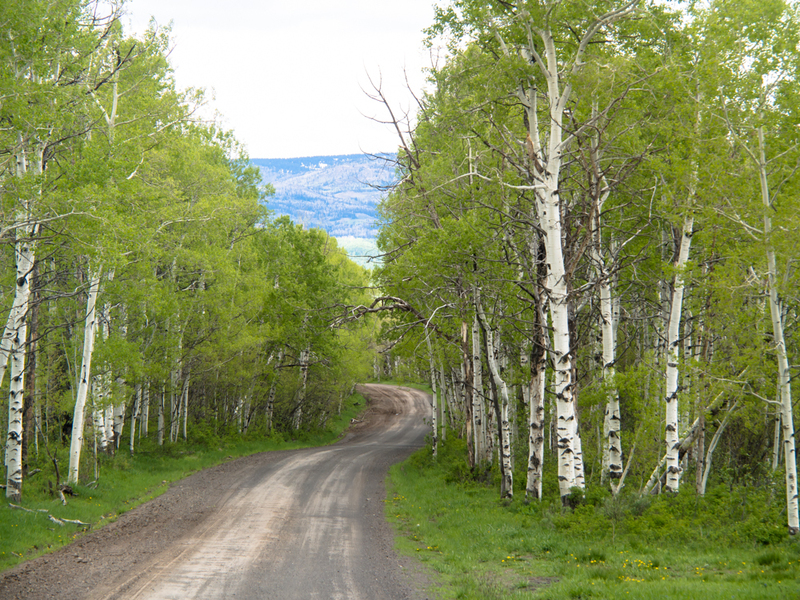 We left Red Fleet state park and headed north into the Uinta Mountains. Sadly, our plans were impaired by closed roads due to snow. But, we came up with alternate routes that provided great scenery. North of Vernal, UT we came to the Simplot Potash mine. 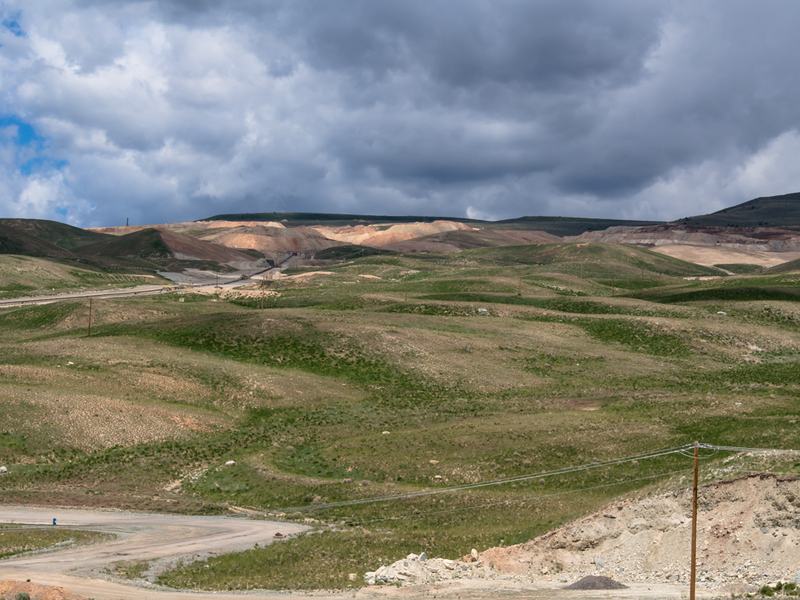 The mine covered a large area and they moved plenty of earth to recover the minerals. The active excavation area was several miles from the loading point and the ore was moved via a large conveyor system visible at the left of the photo above. We took a turn for the Red Cloud Loop road and then took a side trail to an overlook point. 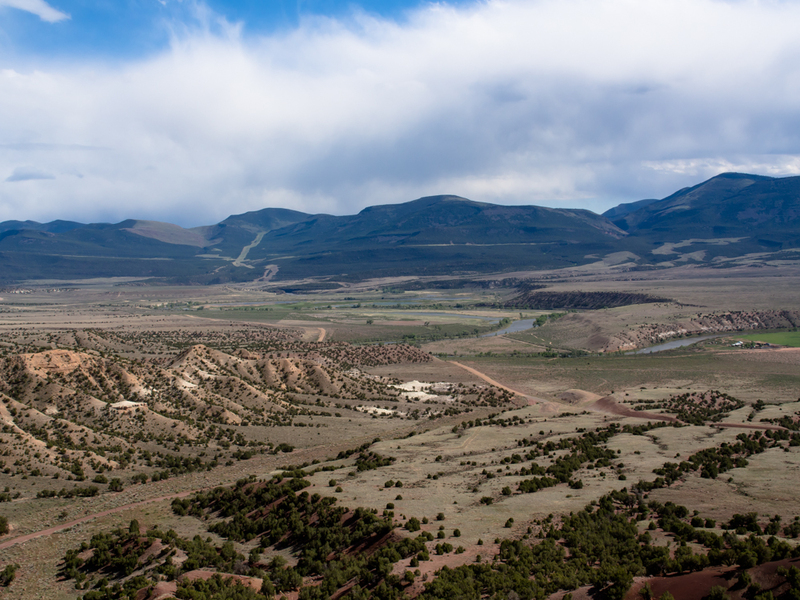 The viewpoint provided an expansive view of the Vernal valley. 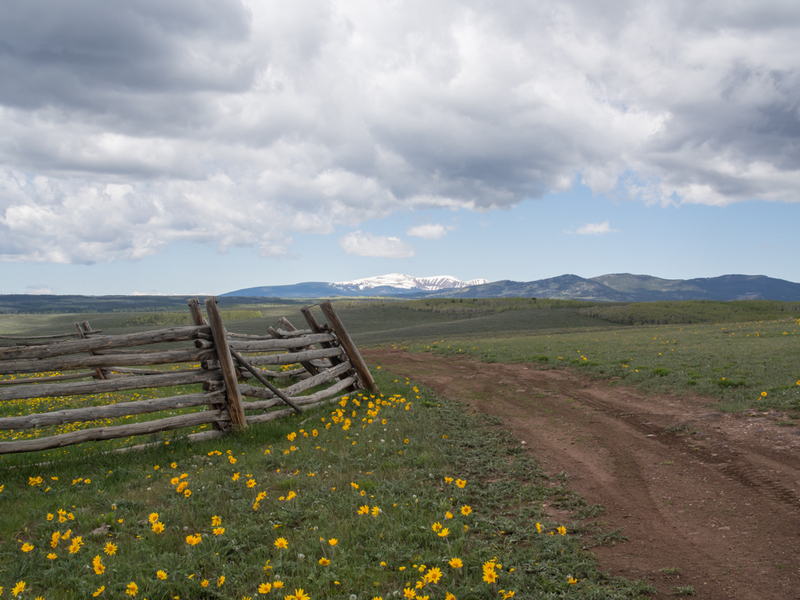 The snow-covered peaks of the Uinta Mountains were visible on the western horizon. The old west is alive in the Unita. 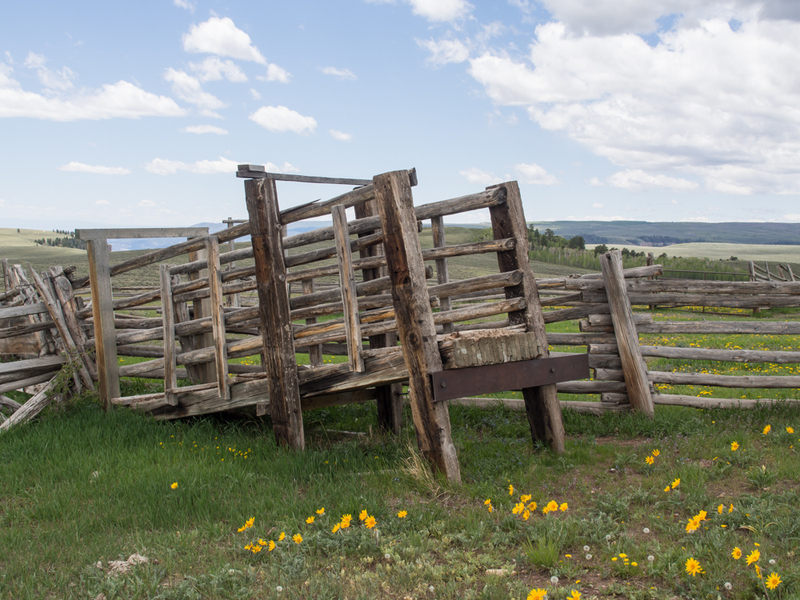 This is a cattle loading chute used to get the cattle from the summer pastures to market. 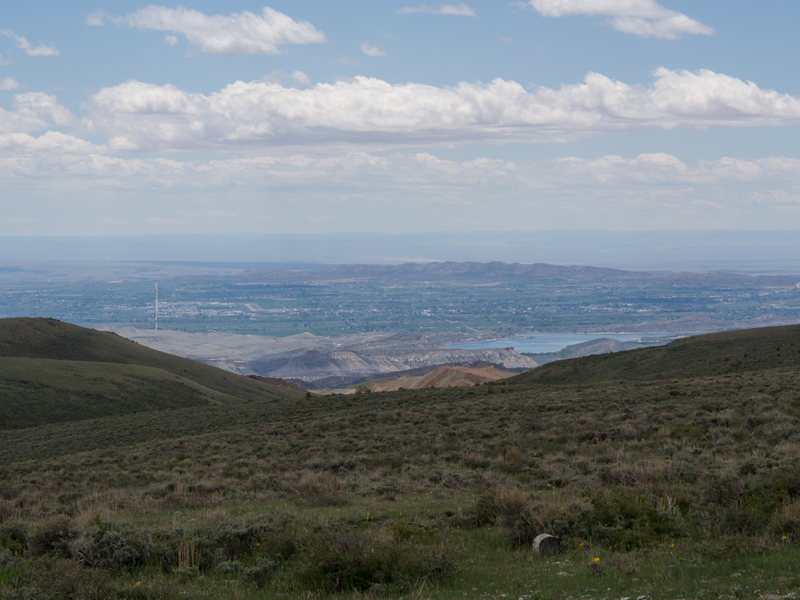 We crossed the Unita and descended into Dutch John, UT on the north side of the mountains. 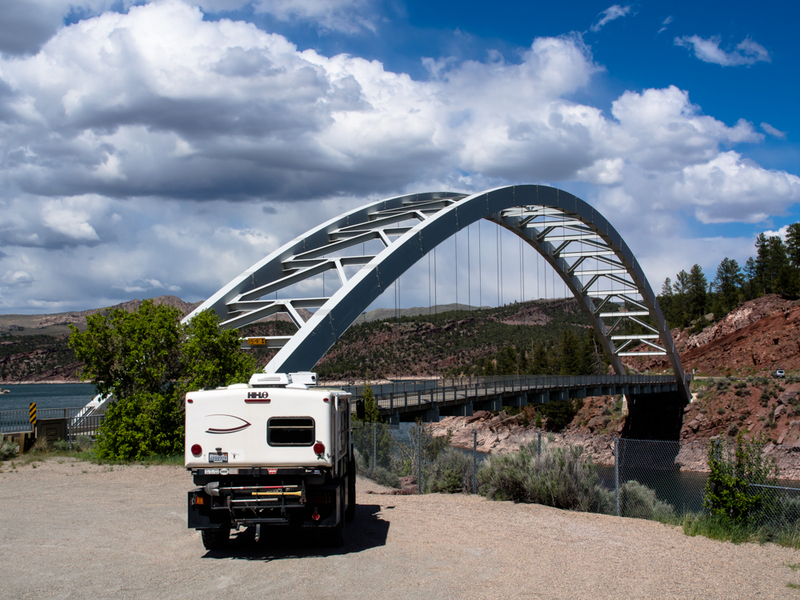 On the southern end of Flaming Gorge Reservoir is an interesting bridge that crosses one finger of the lake. It was blowing hard, note the whitecaps on the water. The lip of the dam is visible above the 500 foot deep reservoir. The highway crosses the reservoir on the top of the dam. 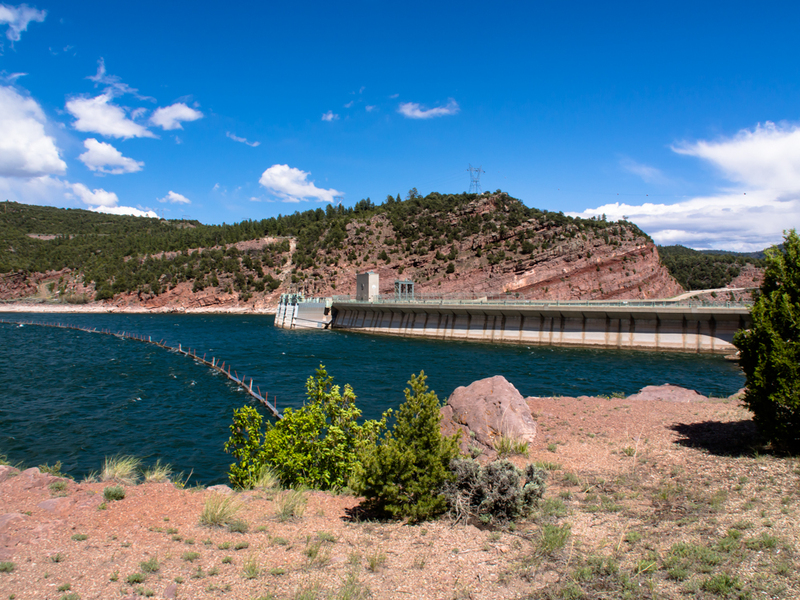 Flaming Gorge dam backs up the Green River and was the last "high dam" built by the Bureau of Reclamation. This crane is used to service the components of the dam. The crane moves on rails to where it is needed and then moved back out of the road. 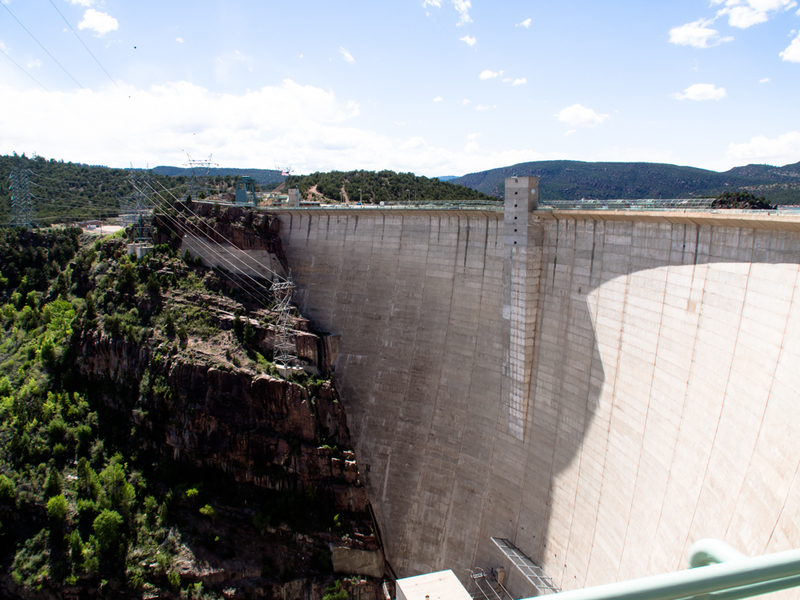 Once we crossed the top of the dam, we got a view of the size of the structure. The powerhouse is the structure at the bottom of the photo. We crossed over the ridge to north of the valley and then turned into Clay Basin. Clay Basin has many oil and gas wells. On the exit from Clay Basin we had a view of the Green River basin. The stripe on the far hills is the pipeline corridor that carries the oil and gas south over the Unita range. 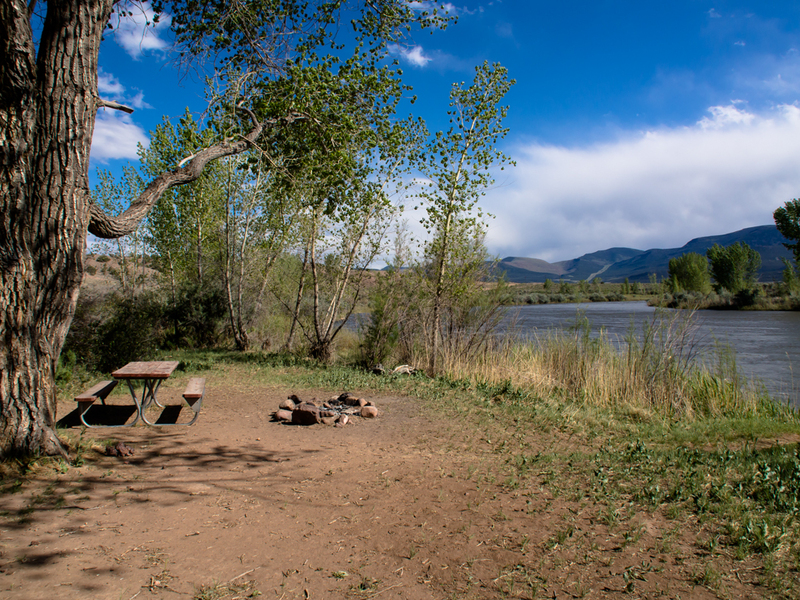 We got down to the river and found a great camp right on the Green River. The good news was that the site was empty and right on the river. The bad news was that the wind was blowing 40 mph and the dust made being outside unbearable. So, we retreated to the camper for the evening. 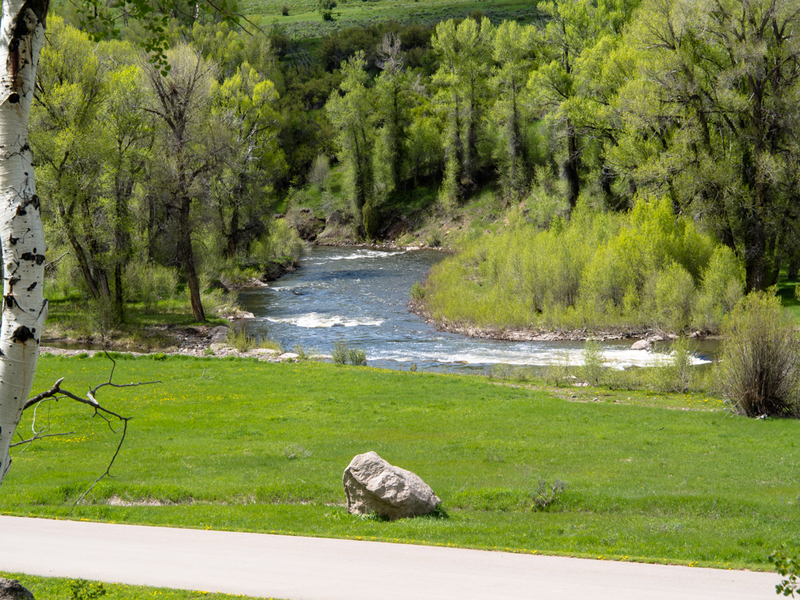 The pipeline corridor was visible on the far ridge beyond the fast flowing Green River. After a cold, windy night headed out. Our first stop was a small set of rapids near the pipeline crossing under the Green River. We generally followed the Green River to the Gates of Lodore. 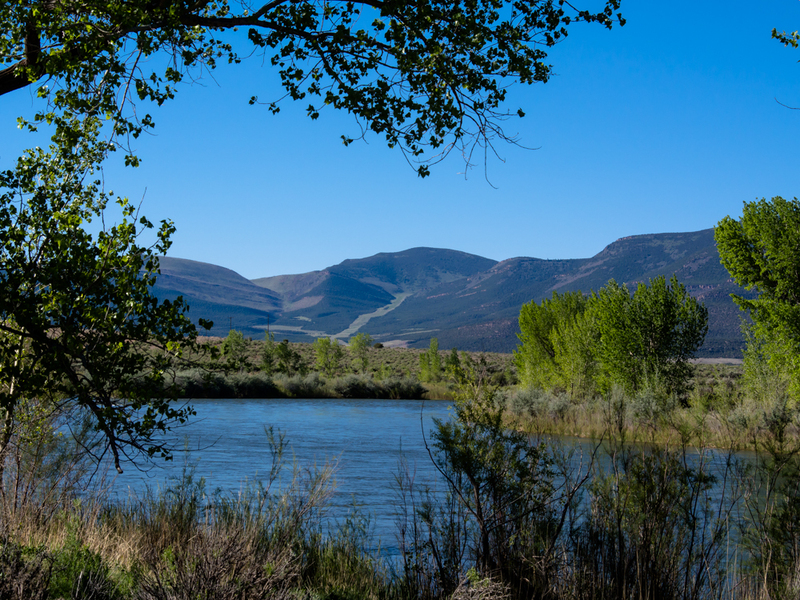 The river cuts through the Uinta mountains leaving a huge gorge. 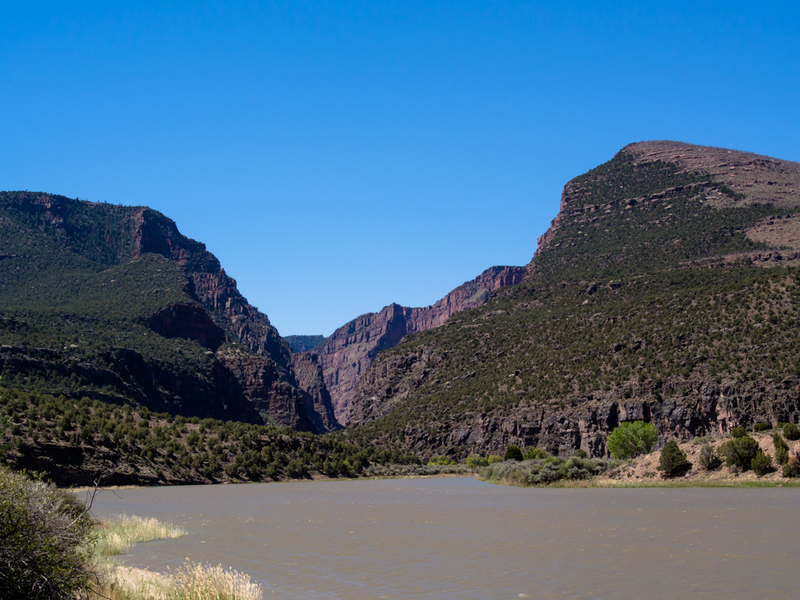 The Gates of Lodore were historically known as the point of no return for the Powell Expedition when they first explored the Colorado River and its canyons. 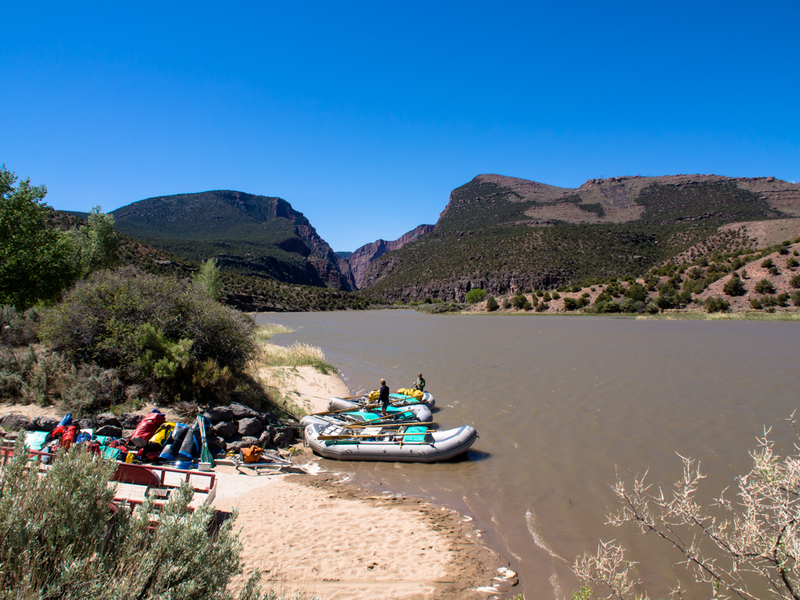 Today, it is a BLM campsite and a common put-in site for river rafters. Above, a group of rafters prepare to set off down the Green River. The Gates of Lodore are sizable cliffs comparable to Marble Canyon. 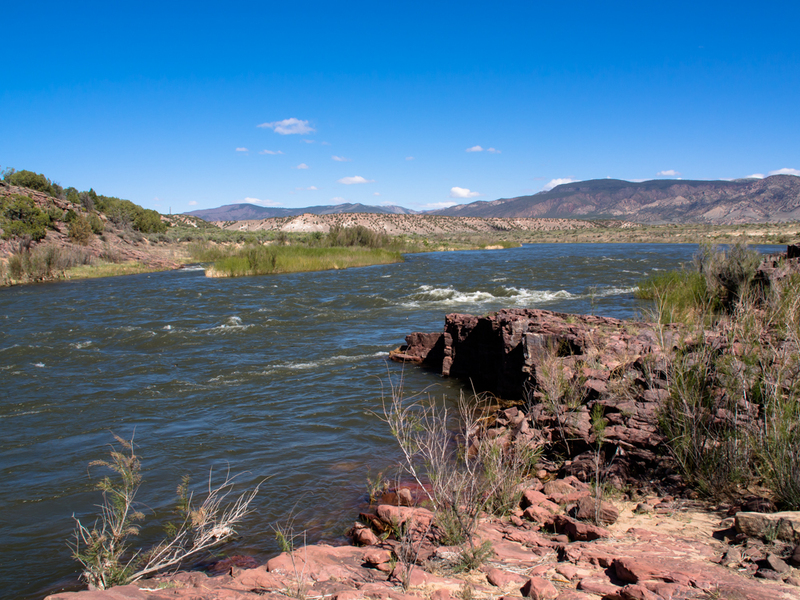 The Green River held its course as the Uinta range uplifted creating the deep canyon. One of the old explorer's cabins at the Gates of Lodore was converted to rentable quarters for river rafters. 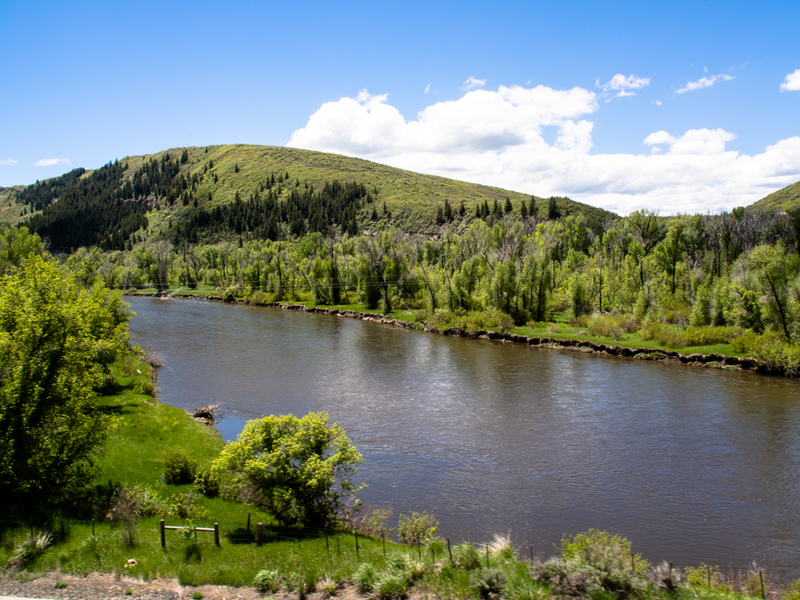 We continued generally southeast over multiple ridges until we got to Craig, CO. We did a resupply in Craig and spent the night at a state park on the Yampa River. The terrain was heavily wooded close to the river. We turned north on a county road and headed into the mountains. 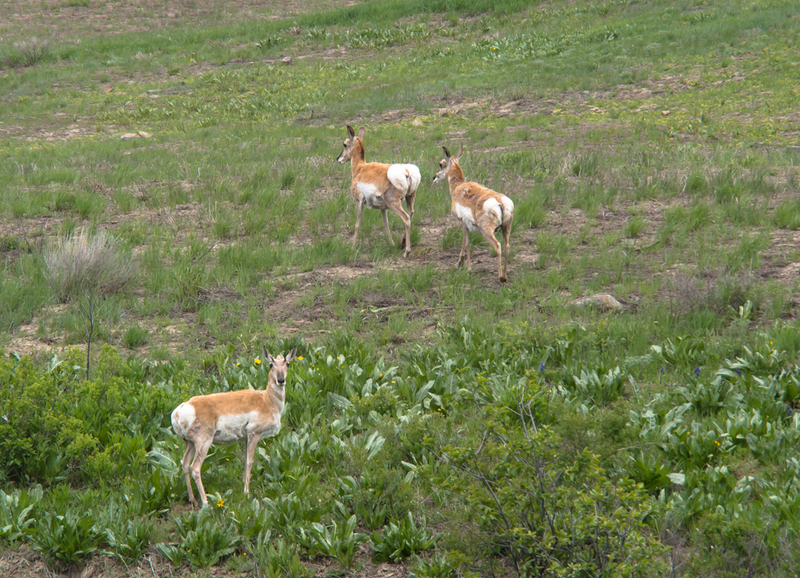 On the way we spotted these antelopes. The last one just stood and stared at Thor as we passed. We went higher into the mountains and got nice views of the fields and snowy mountains. 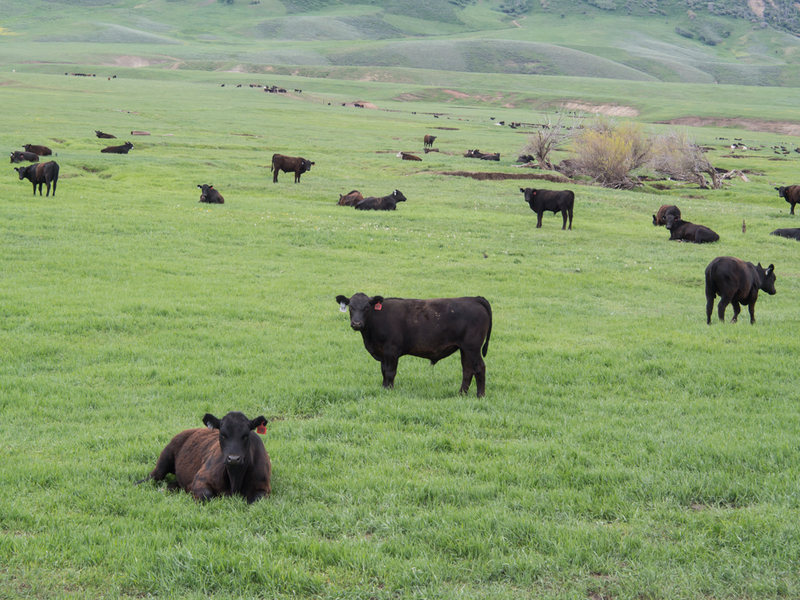 The high meadows were heavily used for cattle ranching. We passed many good-sized herds. In the distance to the east we got a view of the ski runs at Steamboat Springs. 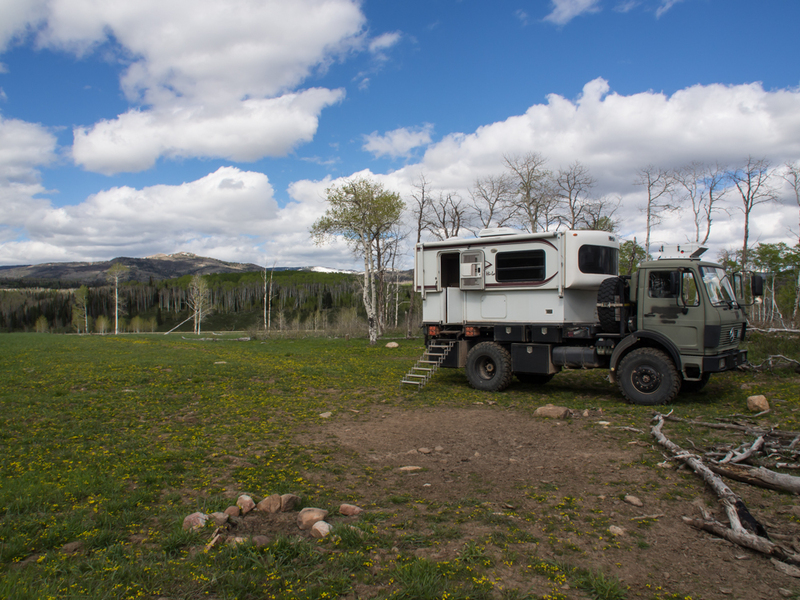 We stopped at a local cafe near Steamboat Lake for chow. After lunch, we continued north further into the hills and spotted a small logging operation. 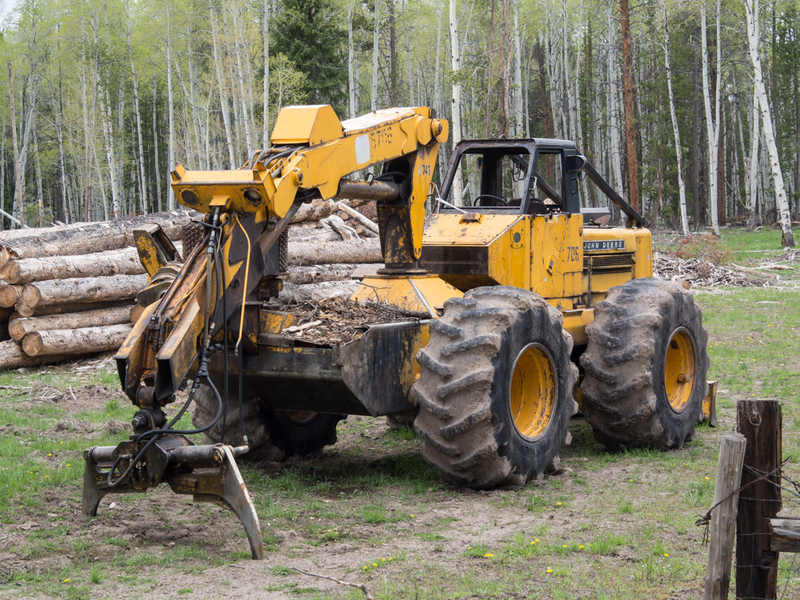 This device is a log loader. 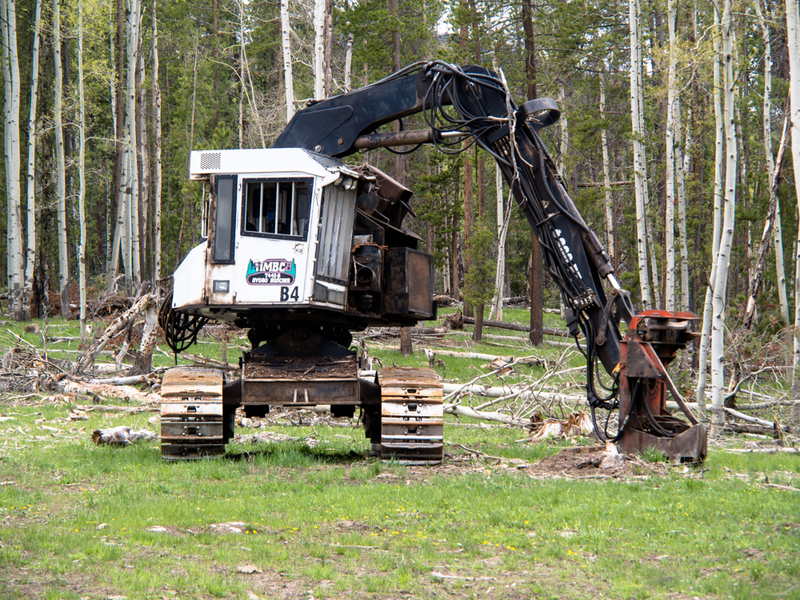 This device cuts the trees and then places the logs in a pile for later retrieval. Our path took us through nice stands of Aspen trees. 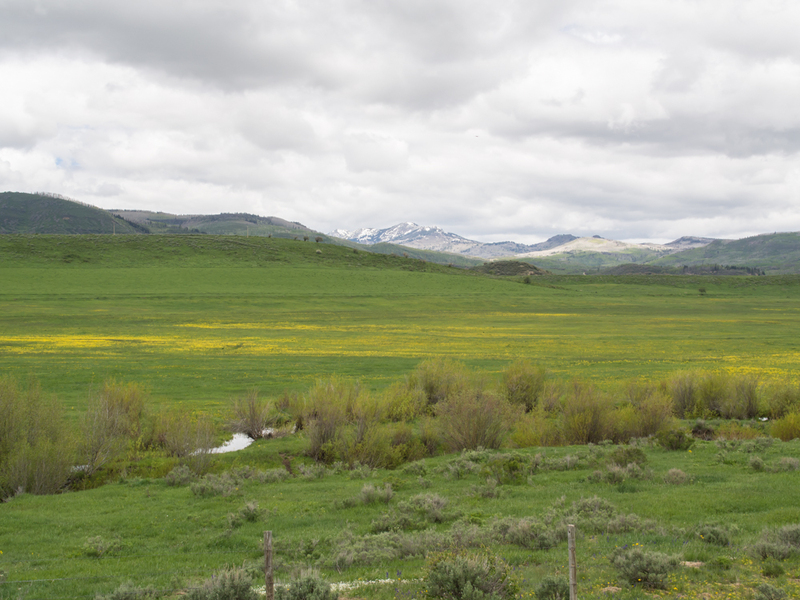 As we descended into the valley at the Wyoming border, we saw something unexpected. We came to a sign for the Three Forks Ranch. The ranch had plenty of free cash as could be seen from the miles of fence. 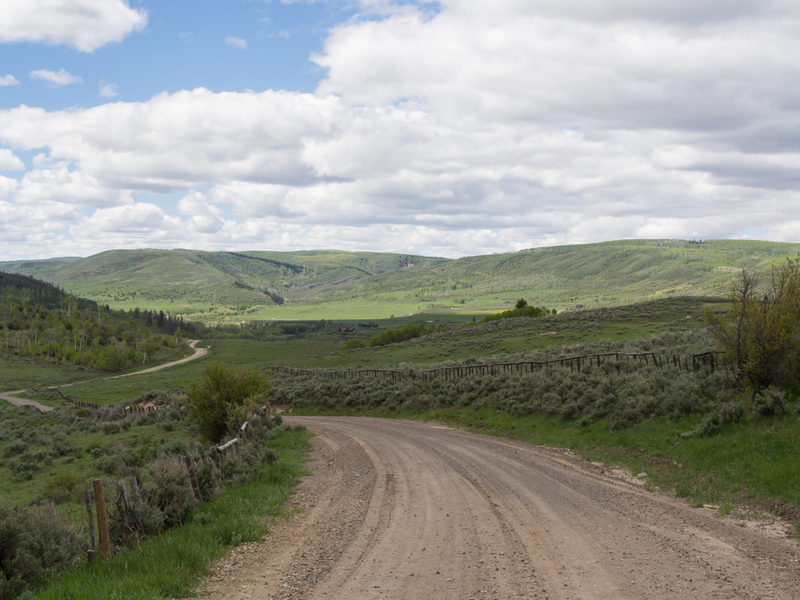 It turns out that the ranch has (at least) the entire mountain in the distance as well as the valley. 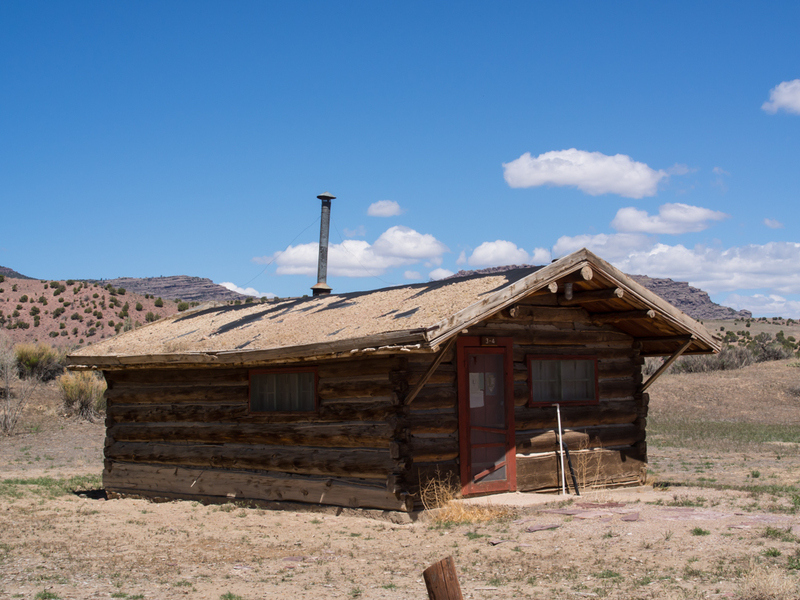 We finally came to to the Three Forks ranch house. This place has nothing on the Hearst Mansion. We were blown away by the scope of their operations as well as the size of the house. 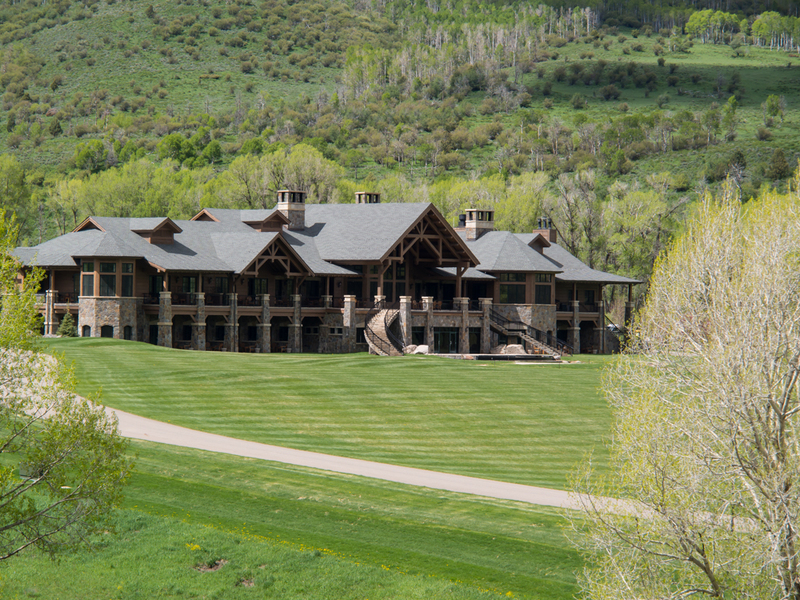 The mansion sat next to the Little Snake River. 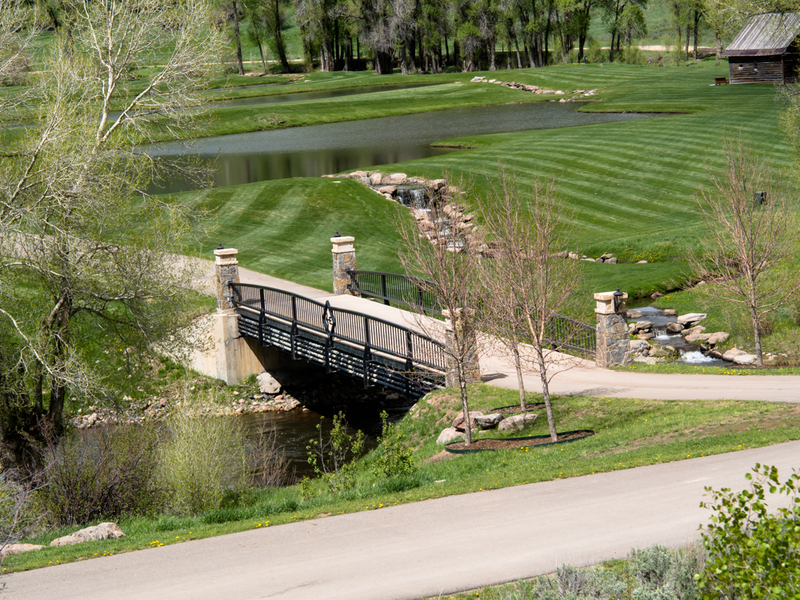 The mansion had a small lake in front just across the bridge with custom iron-work. 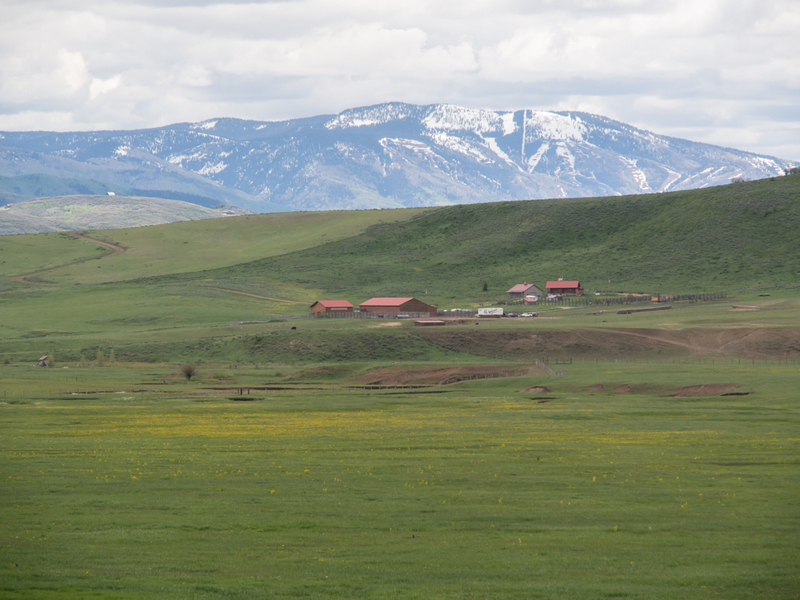 Our heads exploded when we saw the Three Forks Ranch. We continued on until we hit the blacktop, then headed east for a bit, then north. We found a nice spot for the night in a broad meadow. 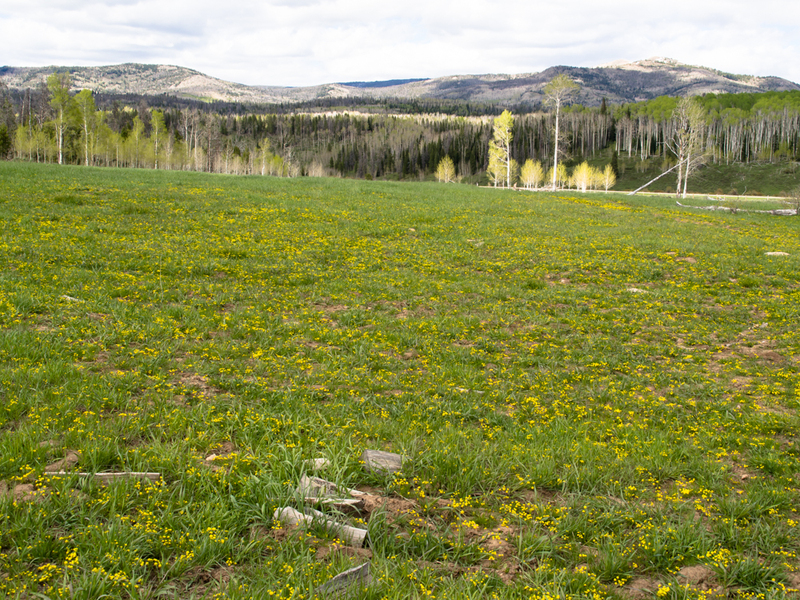 The meadow had nice yellow flowers and a great view of the mountains beyond. This doe came by to investigate us. 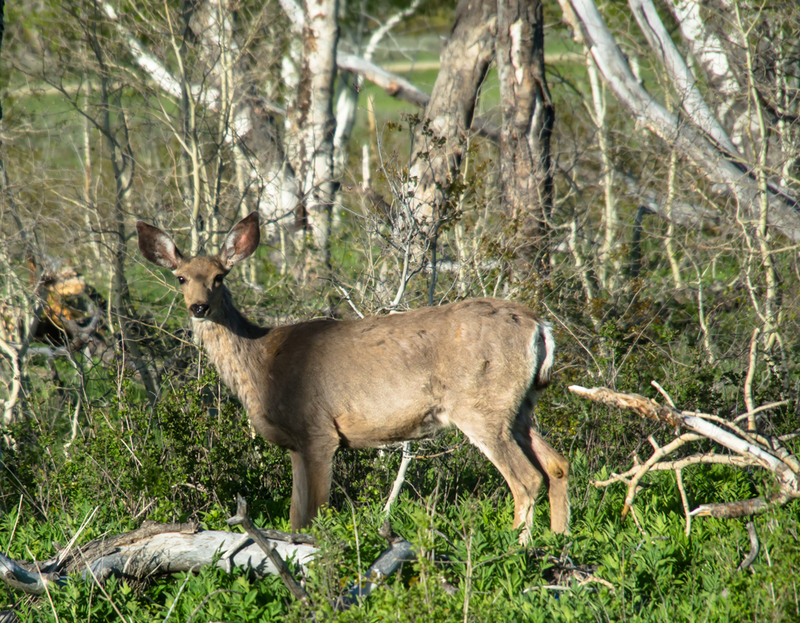 She got close, but kept her distance and came back several times. 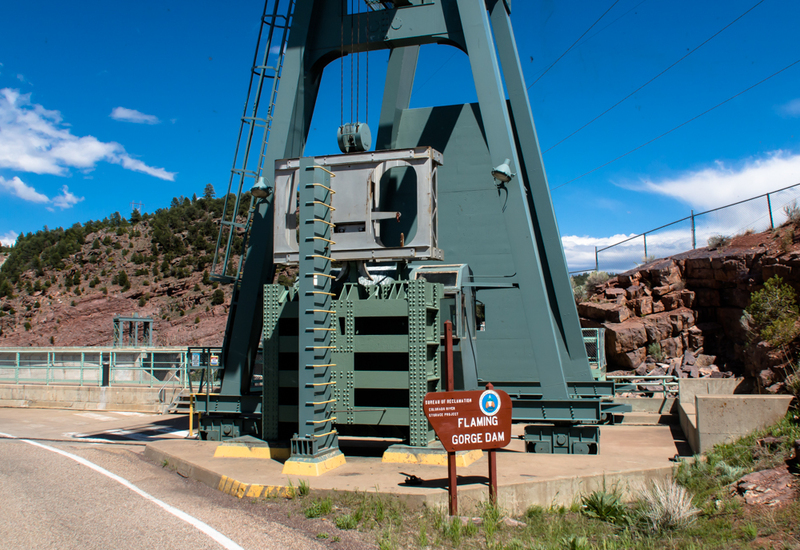 Flaming Gorge is a nice place; it was a shame that the wind was blowing so strong. The Green River valley is worth exploring particularly the Gates of Lodore area. Tomorrow, we head north into central Wyoming.